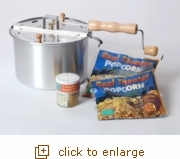 This gift set is perfect for anyone new to homemade stovetop popcorn. Make the delicious Movie Theater tasting popcorn in the comfort of your own kitchen. * Original Whirley Pop Stovetop Popcorn Popper. * 2 Real Theater All-Inclusive Popcorn Popping Kits. Cut, Pour and Pop. Has your Big & Yellow Popcorn, Real Theater Coconut Popping Oil and Movie Theater Seasoning Pre-Measured out for you.